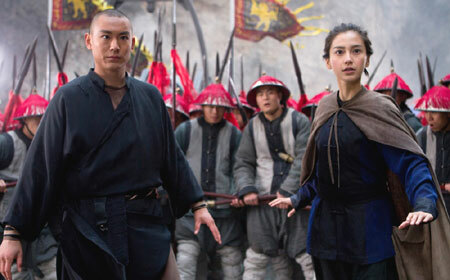 Jayden Yuan and Angelababy in Tai Chi Hero. The Skinny: Tai Chi Hero has more character and less geek culture references but it lacks the strong emotions or rousing set pieces that a "zero to hero" tale should possess. Newcomer Jayden Yuan looks lost but William Feng and Tony Leung Ka-Fai are fine. An underwhelming end to a promising-looking duology that doesn't excite for a supposed third film. Tai Chi Hero brings Chen Kuo-Fu and Stephen Fung’s Tai Chi duology to a close – except this series is supposed to be a trilogy and unlike the first two films, which saw release within weeks of each other, the third film won’t be arriving until at least 2014. Assuming they actually start production in 2013, that is. Thankfully, Tai Chi Hero ends on less of a cliffhanger than Tai Chi 0, tying up nearly all loose ends except for one nagging promise of revenge. Not-so-thankfully, Tai Chi Hero is poorly paced, lazily developed and ends anticlimactically, with tension and emotion rendered inert after the film’s second act. Presumably the third film can end things on a high note, but given the underwhelming feelings that the first two films evoke, the prospect of a third film isn’t that appealing. Ultimately, this whole Tai Chi experiment feels like a minor letdown. Spoilers follow if you have yet to see Tai Chi 0. Plot: when we last left Yang Lu-Chan (Jayden Yuan), he was preparing to marry Chen Yu-Niang (Angelababy) – a union pressed onto Yu-Niang by her father, Master Chen Chang-Xing (Tony Leung Ka-Fai), to enable Lu-Chan to learn Chen family kung-fu. As detailed in the first film, outsiders to Chen Village can’t learn Chen family kung-fu, and Lu-Chan needs Chen kung-fu to restore his inner workings, which are burnt out due to the “Three Blossoms of the Crown”, the horn-shaped birthmark on his head that makes him a kung-fu monster. Yu-Niang agrees to save Lu-Chan’s life, but she doesn’t love him and makes him sleep on the floor. She also demands to be called “Master” while relentlessly training him in Chen kung-fu. Will Lu-Chan somehow charm Yu-Niang with his savant-like kung-fu and dopey, aw-shucks charm? And can he do it before bad guys show up for a requisite action set piece? Sure he can, just not convincingly. Hero is a step up from Zero in that it concentrates more on the characters and less on its gimmicks and media references. Though Yu-Niang never faces her role in the death of Claire (Mandy Lieu) in the first film, she does have to come to terms with her relationship with Lu-Chan. Angelababy fits her role well but Yu-Niang’s eventual acceptance of Lu-Chan comes without a compelling buildup. It doesn’t help that Angelababy and Jayden Yuan share little chemistry, nor that Yuan is an unconvincing actor and his character an uninteresting simpleton. Lu-Chan’s arc comes about through omniscient narration and third-party exposition, marking time between script-appointed set pieces that arrive regularly like road signs on an empty expressway. Everything here feels too easy, the emotions and outcomes never fought for or earned. Sure, the film says that the characters struggle but the performances and direction don’t get that across. There are bright spots. Besides the excellent Tony Leung Ka-Fai, there’s William Feng as Chen Zai-Yang, eldest brother of the Chen family, who showed up at the end of Tai Chi 0 as a seeming antagonist. Zai-Yang is estranged from Master Chen and may be in league with the bad guys, but he’s got a decent character arc that William Feng ably performs. Zai-Yang has charismatic and also humbling qualities, and Feng gives a layered and ultimately sympathetic performance. As Zai-Yang’s mute martial arts expert wife, Nikki Hsieh has screen presence but is sadly underused. Eddie Peng suffers a bit this time as Yu-Niang’s childhood sweetheart Ji-Zing, who’s gone from an arguably justified malcontent to full mustache-twirling villain. Still, given the film’s jokey handling and Peng’s huffy acting, Ji-Zing comes off as a pathetic and butthurt Looney Tunes bad guy. There are hints that Ji-Zing will regroup for another shot at revenge, but the film doesn’t generate the excitement for such a return. Tai Chi Hero’s biggest problem may be that it ends too early. The film’s biggest set- piece is a raid on Chen Village, when Ji-Zing’s cannon-toting soldiers show up to take on kung-fu heroes Master Chen, Yu-Niang and Lu-Chan. The action here is OK; the cutesy video-game references are ditched in favor of Ashes of Time-like smudgey strobing, but the scale and stakes of the sequence compensate. Afterwards the film simply deflates. Post-raid, the characters trek a long distance to earn an audience with Master Li (Yuen Biao! ), but the story loses steam and suspense. First there’s a montage of Lu-Chan taking on various masters in a Scott Pilgrim-like videogame format, which at this late stage feels like jokey filler. The final fight with Master Li corrects matters somewhat. Sammo Hung’s choreography finally gets a chance to shine, but the payoff is oddly philosophical and not rousing. In the end, there’s simply not enough at stake – or, if there is, the filmmakers didn’t convey it.  Tai Chi 0 performed so poorly in Hong Kong that the 2D version of Tai Chi Hero was not booked in cinemas. In mainland China, both Tai Chi 0 and Tai Chi Hero played in IMAX 3D.